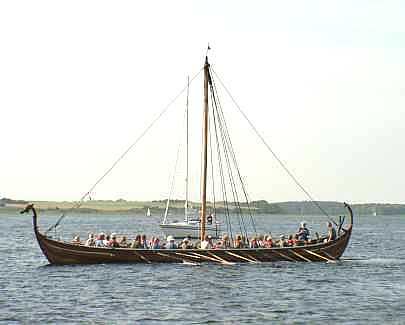 Dragon’s heads are often taken to be synonymous with Viking ships, but if at all, only the warships sported them, and possibly they were only mounted when attacking. The Helge Ask is a warship, albeit a small one, and it is probably the most beautiful one to be seen in Danish waters. Fully painted in bright colours, and with dragon´s head and tail mounted, it gives a very vivid impression of the colourful past. The decoration, however, is fully authentic. 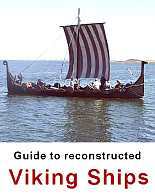 As always, the aim of the Viking Ship Museum has been to get as close to the original as possible in the working process as well in the ship itself, and the Vikings were certainly very fond of colours and illustrations.